Australia ( /ɒˈstreɪliə/, /əʔ/, colloquially /ʔjə/), officially the Commonwealth of Australia, is an Oceanian country comprising the mainland of the Australian continent, the island of Tasmania, and numerous smaller islands. It is the world's sixth-largest country by total area. 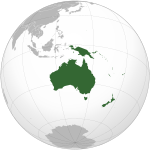 Neighbouring countries include Papua New Guinea, Indonesia and East Timor to the north; the Solomon Islands and Vanuatu to the north-east; and New Zealand to the south-east. After the European discovery of the continent by Dutch explorers in 1606, Australia's eastern half was claimed by Great Britain in 1770 and initially settled through penal transportation to the colony of New South Wales from 26 January 1788. The population grew steadily in subsequent decades; the continent was explored and an additional five self-governing crown colonies were established. On 1 January 1901, the six colonies federated, forming the Commonwealth of Australia. Since Federation, Australia has maintained a stable liberal democratic political system that functions as a federal parliamentary democracy and constitutional monarchy comprising six states and several territories. The population of 23.6 million is highly urbanised and heavily concentrated in the eastern states and on the coast. Australia is a developed country and one of the wealthiest in the world, with the world's 12th-largest economy. In 2014 Australia had the world's fifth-highest per capita income. Australia's military expenditure is the world's 13th-largest. With the second-highest human development index globally, Australia ranks highly in many international comparisons of national performance, such as quality of life, health, education, economic freedom, and the protection of civil liberties and political rights. Australia is a member of the United Nations, G20, Commonwealth of Nations, ANZUS, Organisation for Economic Co-operation and Development (OECD), World Trade Organization, Asia-Pacific Economic Cooperation, and the Pacific Islands Forum. Pronounced [əˈstɹæɪljə, -liə] in Australian English, the name Australia is derived from the Latin australis, meaning "southern". The country has been referred to colloquially as Oz since the early 20th century. [N 4] Aussie is a common colloquial term for "Australian". In neighbouring New Zealand, and less commonly in Australia itself, the noun "Aussie" is also used to refer to the nation, as distinct from its residents. The sporting anthem C'mon Aussie C'mon is an example of the use of Aussie as a synonym for Australia. The name "Austrialia" was used for the first time by Quiros – in May 1606. Austrialia was altered or 'corrected' to Australia over time (one example shown). The first recorded European sighting of the Australian mainland, and the first recorded European landfall on the Australian continent, are attributed to the Dutch navigator Willem Janszoon. He sighted the coast of Cape York Peninsula in early 1606, and made landfall on 26 February at the Pennefather River near the modern town of Weipa on Cape York. The Dutch charted the whole of the western and northern coastlines and named the island continent "New Holland" during the 17th century, but made no attempt at settlement. William Dampier, an English explorer and privateer, landed on the north-west coast of New Holland in 1688 and again in 1699 on a return trip. In 1770, James Cook sailed along and mapped the east coast, which he named New South Wales and claimed for Great Britain. With the loss of its American colonies in 1783, the British Government sent a fleet of ships, the "First Fleet", under the command of Captain Arthur Phillip, to establish a new penal colony in New South Wales. A camp was set up and the flag raised at Sydney Cove, Port Jackson, on 26 January 1788, a date which became Australia's national day, Australia Day although the British Crown Colony of New South Wales was not formally promulgated until 7 February 1788. The first settlement led to the foundation of Sydney, the establishment of farming, industry and commerce; and the exploration and settlement of other regions. A British settlement was established in Van Diemen's Land, now known as Tasmania, in 1803 and it became a separate colony in 1825. The United Kingdom formally claimed the western part of Western Australia (the Swan River Colony) in 1828. Separate colonies were carved from parts of New South Wales: South Australia in 1836, Victoria in 1851, and Queensland in 1859. The Northern Territory was founded in 1911 when it was excised from South Australia. South Australia was founded as a "free province"—it was never a penal colony. Victoria and Western Australia were also founded "free", but later accepted transported convicts. A campaign by the settlers of New South Wales led to the end of convict transportation to that colony; the last convict ship arrived in 1848. Australia is a constitutional monarchy with a federal division of powers. It uses a parliamentary system of government with Queen Elizabeth II at its apex as the Queen of Australia, a role that is distinct from her position as monarch of the other Commonwealth realms. The Queen resides in the United Kingdom, and she is represented by her viceroys in Australia (the Governor-General at the federal level and by the Governors at the state level), who by convention act on the advice of her ministers. Supreme executive authority is vested by the Constitution of Australia in the sovereign, but the power to exercise it is conferred by the Constitution specifically on the Governor-General. The most notable exercise to date of the Governor-General's reserve powers outside the Prime Minister's request was the dismissal of the Whitlam Government in the constitutional crisis of 1975. Following a partyroom leadership challenge, Julia Gillard became the first female Prime Minister in June 2010. The most recent federal election was held on 7 September 2013 and resulted in a majority government for the Coalition. Liberal Party leader Tony Abbott was sworn into office as Prime Minister by the Governor-General of Australia on 18 September. Norfolk Island is also technically an external territory; however, under the Norfolk Island Act 1979 it has been granted more autonomy and is governed locally by its own legislative assembly. The Queen is represented by an Administrator. Australia has pursued the cause of international trade liberalisation. It led the formation of the Cairns Group and Asia-Pacific Economic Cooperation. Australia is a member of the Organisation for Economic Co-operation and Development and the World Trade Organization, and has pursued several major bilateral free trade agreements, most recently the Australia – United States Free Trade Agreement and Closer Economic Relations with New Zealand, with another free trade agreement being negotiated with China—the Australia–China Free Trade Agreement—and Japan, South Korea in 2011, Australia–Chile Free Trade Agreement, ASEAN – Australia – New Zealand Free Trade Area, and the Trans-Pacific Strategic Economic Partnership. Australia's landmass of 7,617,930 square kilometres (2,941,300 sq mi) is on the Indo-Australian Plate. Surrounded by the Indian and Pacific oceans,[N 5] it is separated from Asia by the Arafura and Timor seas, with the Coral Sea lying off the Queensland coast, and the Tasman Sea lying between Australia and New Zealand. The world's smallest continent and sixth largest country by total area, Australia—owing to its size and isolation—is often dubbed the "island continent", and is sometimes considered the world's largest island. Australia has 34,218 kilometres (21,262 mi) of coastline (excluding all offshore islands), and claims an extensive Exclusive Economic Zone of 8,148,250 square kilometres (3,146,060 sq mi). This exclusive economic zone does not include the Australian Antarctic Territory. Apart from Macquarie Island, Australia lies between latitudes 9° and 44°S, and longitudes 112° and 154°E. The Great Barrier Reef, the world's largest coral reef, lies a short distance off the north-east coast and extends for over 2,000 kilometres (1,240 mi). Mount Augustus, claimed to be the world's largest monolith, is located in Western Australia. At 2,228 metres (7,310 ft), Mount Kosciuszko on the Great Dividing Range is the highest mountain on the Australian mainland. Even taller are Mawson Peak (at 2,745 metres or 9,006 ft), on the remote Australian territory of Heard Island, and, in the Australian Antarctic Territory, Mount McClintock and Mount Menzies, at 3,492 metres (11,457 ft) and 3,355 metres (11,007 ft) respectively. The landscapes of the Top End and the Gulf Country – with their tropical climate – include forest, woodland, wetland, grassland, rainforest and desert. At the north-west corner of the continent are the sandstone cliffs and gorges of The Kimberley, and below that the Pilbara. To the south of these and inland, lie more areas of grassland: the Ord Victoria Plain and the Western Australian Mulga shrublands. At the heart of the country are the uplands of central Australia. Prominent features of the centre and south include Uluru (also known as Ayers Rock), the famous sandstone monolith, and the inland Simpson, Tirari and Sturt Stony, Gibson, Great Sandy, Tanami, and Great Victoria deserts, with the famous Nullarbor Plain on the southern coast. The climate of Australia is significantly influenced by ocean currents, including the Indian Ocean Dipole and the El Niño–Southern Oscillation, which is correlated with periodic drought, and the seasonal tropical low-pressure system that produces cyclones in northern Australia. These factors cause rainfall to vary markedly from year to year. Much of the northern part of the country has a tropical, predominantly summer-rainfall (monsoon) climate. The southwest corner of the country has a Mediterranean climate. Much of the southeast (including Tasmania) is temperate. Although most of Australia is semi-arid or desert, it includes a diverse range of habitats from alpine heaths to tropical rainforests, and is recognised as a megadiverse country. Fungi typify that diversity; an estimated 250,000 species—of which only 5% have been described—occur in Australia. Because of the continent's great age, extremely variable weather patterns, and long-term geographic isolation, much of Australia's biota is unique and diverse. About 85% of flowering plants, 84% of mammals, more than 45% of birds, and 89% of in-shore, temperate-zone fish are endemic. Australia has the greatest number of reptiles of any country, with 755 species. 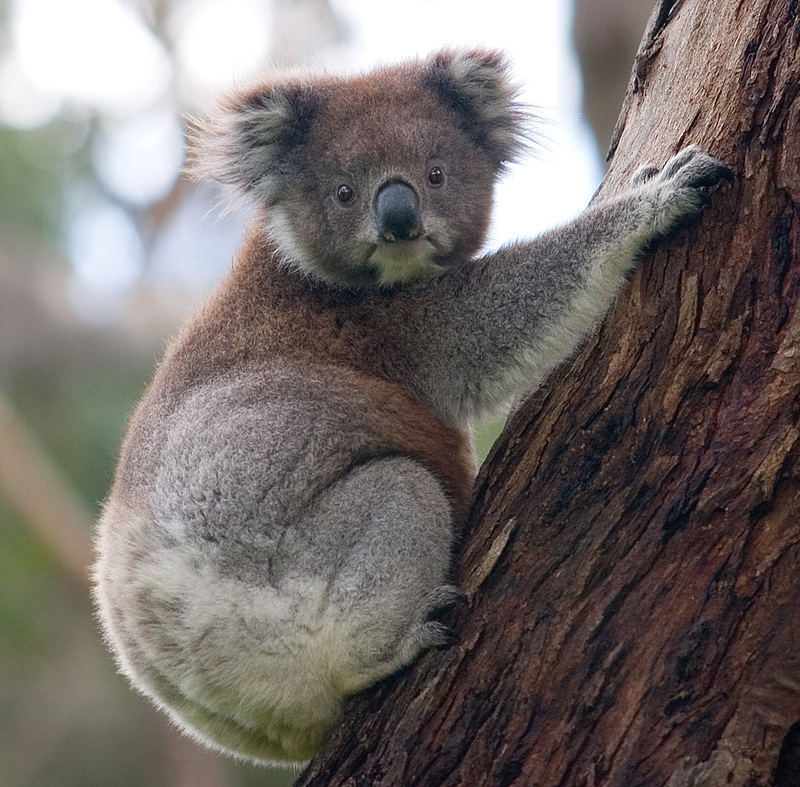 Australian forests are mostly made up of evergreen species, particularly eucalyptus trees in the less arid regions, wattles replace them in drier regions and deserts as the most dominant species. Among well-known Australian animals are the monotremes (the platypus and echidna); a host of marsupials, including the kangaroo, koala, and wombat, and birds such as the emu and the kookaburra. Australia is home to many dangerous animals including some of the most venomous snakes in the world. The dingo was introduced by Austronesian people who traded with Indigenous Australians around 3000 BCE. Many animal and plant species became extinct soon after first human settlement, including the Australian megafauna; others have disappeared since European settlement, among them the thylacine. Drought affecting Lake Hume on the Upper Murray River. According to the Bureau of Meteorology's 2011 Australian Climate Statement, Australia had lower than average temperatures in 2011 as a consequence of a La Niña weather pattern, however, "the country's 10-year average continues to demonstrate the rising trend in temperatures, with 2002–2011 likely to rank in the top two warmest 10-year periods on record for Australia, at 0.52 °C above the long-term average". Furthermore, 2014 was Australia's third warmest year since national temperature observations commenced in 1910. Water restrictions are frequently in place in many regions and cities of Australia in response to chronic shortages due to urban population increases and localised drought. Throughout much of the continent, major flooding regularly follows extended periods of drought, flushing out inland river systems, overflowing dams and inundating large inland flood plains, as occurred throughout Eastern Australia in 2010, 2011 and 2012 after the 2000s Australian drought. Australia is the world's fourth largest exporter of wine. The Barossa Valley is a major wine-producing region in South Australia. Australia has one of the world's most highly urbanised populations with the majority living in metropolitan cities on the coast. For generations, the vast majority of immigrants came from the British Isles, and the people of Australia are still mainly of British and/or Irish ethnic origin. In the 2011 Australian census, the most commonly nominated ancestry was English (36.1%), followed by Australian (35.4%), Irish (10.4%), Scottish (8.9%), Italian (4.6%), German (4.5%), Chinese (4.3%), Indian (2.0%), Greek (1.9%), and Dutch (1.7%). Before European settlement, the animist beliefs of Australia's indigenous people had been practised for many thousands of years. Mainland Aboriginal Australians', spirituality is known as the Dreamtime and it places a heavy emphasis on belonging to the land. The collection of stories that it contains shaped Aboriginal law and customs. Aboriginal art, story and dance continue to draw on these spiritual traditions. The spirituality and customs of Torres Strait Islanders, who inhabit the islands between Australia and New Guinea, reflected their Melanesian origins and dependence on the sea. The 1996 Australian census counted more than 7000 respondents as followers of a traditional Aboriginal religion. Since the arrival of the First Fleet of British ships in 1788, Christianity has grown to be the major religion practised in Australia. Christian churches have played an integral role in the development of education, health and welfare services in Australia. For much of Australian history the Church of England (now known as the Anglican Church of Australia) was the largest religious affiliation. However, multicultural immigration has contributed to a decline in its relative position, and the Roman Catholic Church has benefitted from recent immigration to become the largest group. Similarly, Islam, Buddhism, Hinduism and Judaism have all grown in Australia over the past half-century. The University of Sydney is the oldest university in Australia. The OECD places Australia among the most expensive nations to attend university. There is a state-based system of vocational training, known as TAFE, and many trades conduct apprenticeships for training new tradespeople. About 58% of Australians aged from 25 to 64 have vocational or tertiary qualifications, and the tertiary graduation rate of 49% is the highest among OECD countries. The ratio of international to local students in tertiary education in Australia is the highest in the OECD countries. Australia has the third and seventh highest life expectancy of males and females respectively in the world. Life expectancy in Australia in 2010 was 79.5 years for males and 84.0 years for females. Australia has the highest rates of skin cancer in the world, while cigarette smoking is the largest preventable cause of death and disease, responsible for 7.8% of the total mortality and disease. Ranked second in preventable causes is hypertension at 7.6%, with obesity third at 7.5%. Australia ranks 35th in the world and near the top of developed nations for its proportion of obese adults. Australian literature grew slowly in the decades following European settlement though Indigenous oral traditions, many of which have since been recorded in writing, are much older. Writers of the 19th-century Bulletin School, such as Henry Lawson and Banjo Paterson, captured the experience of the bush using a distinctive Australian vocabulary. Their works are still very popular; Paterson's bush poem "Waltzing Matilda" (1895) is regarded as Australia's unofficial national anthem. Miles Franklin is the namesake of Australia's most prestigious literary prize, awarded to the best novel about Australian life. Its first recipient, Patrick White, went on to win the Nobel Prize in Literature in 1973. Australian winners of the Man Booker Prize include Peter Carey, Thomas Keneally and Richard Flanagan. David Malouf and David Williamson are also renowned writers and Les Murray is regarded as "one of the leading poets of his generation". Australia is one of five nations to have participated in every Summer Olympics of the modern era, and has hosted the Games twice: 1956 in Melbourne and 2000 in Sydney. Australia has also participated in every Commonwealth Games, hosting the event in 1938, 1962, 1982, 2006 and will host the 2018 Commonwealth Games. As well as being a regular FIFA World Cup participant, Australia has won the OFC Nations Cup four times and the AFC Asian Cup once – the only country to have won championships in two different FIFA confederations. Other major international events held in Australia include the Australian Open tennis grand slam tournament, international cricket matches, and the Australian Formula One Grand Prix. Australia hosted the 2003 Rugby World Cup and the annual Australia–New Zealand Bledisloe Cup is keenly watched. The highest-rating television programs include sports telecasts such as the Summer Olympics, FIFA World Cup, The Ashes, Rugby League State of Origin, and the grand finals of the National Rugby League and Australian Football League. Skiing in Australia began in the 1860s and snow sports take place in the Australian Alps and parts of Tasmania. ^ The Oxford English Dictionary records a first occurrence in 1908, in the form Oss. Oz is often taken as an oblique reference to the fictional Land of Oz in the film The Wizard of Oz (1939), based on L. Frank Baum's novel The Wonderful Wizard of Oz (1900). Australians' "image of Australia as a 'Land of Oz' is not new, and dedication to it runs deep". The spelling Oz is likely to have been influenced by the 1939 film, though the pronunciation was probably always with a /z/, as it is also for Aussie, sometimes spelt Ozzie. The Baz Luhrmann film Australia (2008) makes repeated reference to The Wizard of Oz, which appeared just before the wartime action of Australia. Some critics have even speculated that Baum was inspired by Australia, in naming the Land of Oz: "In Ozma of Oz (1907), Dorothy gets back to Oz as the result of a storm at sea while she and Uncle Henry are travelling by ship to Australia. So, like Australia, Oz is somewhere to the west of California. Like Australia, Oz is an island continent. Like Australia, Oz has inhabited regions bordering on a great desert. One might almost imagine that Baum intended Oz to be Australia, or perhaps a magical land in the center of the great Australian desert." ^ It's an Honour – Symbols – Australian National Anthem and DFAT – "The Australian National Anthem"; "National Symbols". Parliamentary Handbook of the Commonwealth of Australia (29th ed.). 2005 . https://web.archive.org/web/20070611101901/http://www.aph.gov.au/library/handbook/40thparl/national+symbols.pdf. Retrieved 7 June 2007. ^ a b "Pluralist Nations: Pluralist Language Policies?". 1995 Global Cultural Diversity Conference Proceedings, Sydney. Department of Immigration and Citizenship. Archived from the original on 20 December 2008. http://www.immi.gov.au/media/publications/multicultural/confer/04/speech18b.htm. Retrieved 11 January 2009. "English has no de jure status but it is so entrenched as the common language that it is de facto the official language as well as the national language." ^ a b "Population clock". Australian Bureau of Statistics website. Commonwealth of Australia. http://www.abs.gov.au/ausstats/abs@.nsf/94713ad445ff1425ca25682000192af2/1647509ef7e25faaca2568a900154b63?OpenDocument. Retrieved 29 June 2015. The population estimate shown is automatically calculated daily at 00:00 UTC and is based on data obtained from the population clock on the date shown in the citation. ^ Australian Bureau of Statistics (31 October 2012). "Australia". 2011 Census QuickStats. http://www.censusdata.abs.gov.au/census_services/getproduct/census/2011/quickstat/0?opendocument&navpos=220. Retrieved 21 June 2012. ^ a b c d "Australia". International Monetary Fund. April 2015. http://www.imf.org/external/pubs/ft/weo/2015/01/weodata/weorept.aspx?pr.x=76&pr.y=13&sy=2015&ey=2015&scsm=1&ssd=1&sort=country&ds=.&br=1&c=193&s=NGDPD%2CNGDPDPC%2CPPPGDP%2CPPPPC&grp=0&a=. Retrieved 25 April 2015. ^ "OECD Economic Surveys: Norway 2012". http://www.keepeek.com/Digital-Asset-Management/oecd/economics/oecd-economic-surveys-norway-2012/gini-coefficients-before-and-after-taxes-and-transfers_eco_surveys-nor-2012-graph1-en#page1. ^ "Australia". Oxford Dictionaries. Oxford University Press. April 2010. http://oxforddictionaries.com/definition/english/Australia. Retrieved 26 July 2012. ^ "Constitution of Australia". ComLaw. 9 July 1900. http://www.comlaw.gov.au/Details/C2005Q00193/0332ed71-e2d9-4451-b6d1-33ec4b570e9f. Retrieved 5 August 2011. "3. It shall be lawful for the Queen, with the advice of the Privy Council, to declare by proclamation that, on and after a day therein appointed, not being later than one year after the passing of this Act, the people of New South Wales, Victoria, South Australia, Queensland, and Tasmania, and also, if Her Majesty is satisfied that the people of Western Australia have agreed thereto, of Western Australia, shall be united in a Federal Commonwealth under the name of the Commonwealth of Australia." ^ Wade, Nicholas (22 September 2011). "Australian Aborigine Hair Tells a Story of Human Migration". The New York Times. http://www.nytimes.com/2011/09/23/science/23aborigines.html. ^ "European discovery and the colonisation of Australia". Australian Government: Culture Portal. Department of the Environment, Water, Heritage and the Arts, Commonwealth of Australia. 11 January 2008. http://australia.gov.au/about-australia/australian-story/european-discovery-and-colonisation. Retrieved 7 May 2010. "[The British] moved north to Port Jackson on 26 January 1788, landing at Camp Cove, known as 'cadi' to the Cadigal people. Governor Phillip carried instructions to establish the first British Colony in Australia. The First Fleet was under prepared for the task, and the soil around Sydney Cove was poor." ^ "Both Australian Aborigines and Europeans Rooted in Africa – 50,000 years ago". News.softpedia.com. http://news.softpedia.com/news/Both-Aborigines-and-Europeans-Rooted-in-Africa-54225.shtml. Retrieved 27 April 2013. ^ "Geographic Distribution of the Population". http://www.abs.gov.au/ausstats/abs@.nsf/Lookup/by%20Subject/1301.0~2012~Main%20Features~Geographic%20distribution%20of%20the%20population~49. Retrieved 1 December 2012. ^ "Australia: World Audit Democracy Profile". WorldAudit.org. Archived from the original on 13 December 2007. http://www.worldaudit.org/countries/australia.htm. Retrieved 5 January 2008. ^ Jacobson, H. (1988) In the Land of Oz, Penguin, ISBN 0-14-010966-8. ^ Macquarie Dictionary (5th ed.). Macmillan Publishers Australia. 2010. ISBN 9781876429669. ^ a b Kennett, Jeff (11 November 2011). "C'mon Aussie, let's grow up". Herald Sun. http://www.heraldsun.com.au/news/opinion/cmon-aussie-lets-grow-up/story-e6frfhqf-1226185129838. Retrieved 22 February 2014. ^ Claire Harvey, Aussie farewell to life in "Kiwi". Retrieved 29 December 2011. ^ Lee, Julian (27 November 2009). "C'mon Aussie: cricket anthem reprised to get bums on seats". The Sydney Morning Herald. http://www.smh.com.au/business/cmon-aussie-cricket-anthem-reprised-to-get-bums-on-seats-20091126-jum2.html#ixzz2pZNyvOwR. Retrieved 22 February 2014. ^ "before reaching the New Hebrides or what he called Austrialis del Espiritu Santo on 3 May 1606" Quiros, Pedro Fernandez de (1563–1615) Para 4 | Australian Dictionary of Biography. ^ Cartouche of La Gran Baya de S. Philippe y S. Santiago, Prado y Tovar ca.1606-1614 (España. Ministerio de Cultura. Archivo General de Simancas). ^ http://archive.org/details/ZoologyNewHolla1Shaw "First Instance of the Word Australia being applied specifically to the Continent - in 1794"] Zoology of New Holland - Shaw, George,1751-1813; Sowerby, James,1757-1822 Page 2. ^ "THE ILLUSTRATED SYDNEY NEWS". Illustrated Sydney News (National Library of Australia): p. 2. 26 January 1888. http://nla.gov.au/nla.news-article63620938. Retrieved 29 January 2012. ^ Scott, Ernest (2004) . The Life of Captain Matthew Flinders. Kessinger Publishing. p. 299. ISBN 978-1-4191-6948-9. http://books.google.com/?id=DDNEle_1NzkC&pg=PA299. ^ Baker, Sidney J. (1966) The Australian Language, 2nd ed. ^ Flinders, Matthew. "Letter from Matthew Flinders originally enclosing a chart of 'New Holland' (Australia)". Cambridge Digital Library. http://cudl.lib.cam.ac.uk/view/MS-RGO-00014-00051/358. Retrieved 18 July 2014. ^ Bennett, J. J., ed (1866–68). 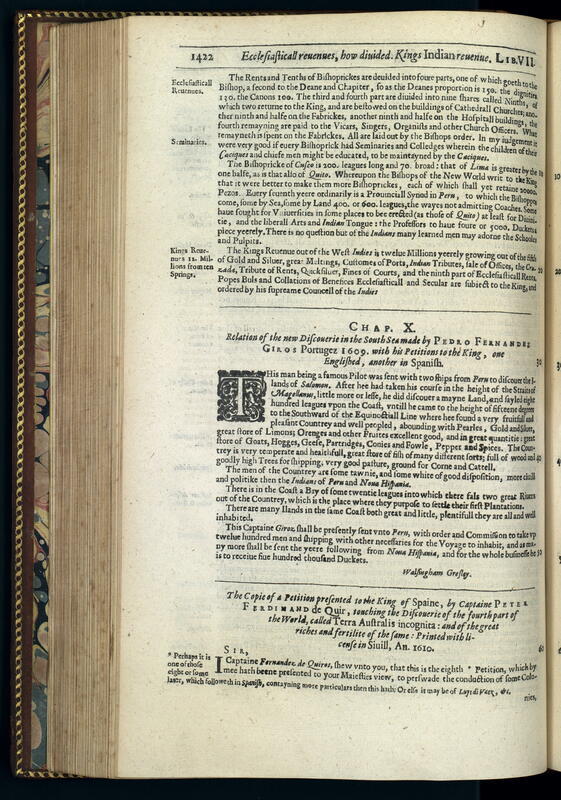 "General remarks, geographical and systematical, on the botany of Terra Australis". The Miscellaneous Botanical Works of Robert Brown, Esq., D.C.L., F.R.S.. 2. pp. 1–89. http://archive.org/details/generalremarksge00brow. ^ "WHO NAMED AUSTRALIA?". The Mail (Adelaide, SA : 1912 – 1954) (Adelaide: National Library of Australia): p. 16. 11 February 1928. http://nla.gov.au/nla.news-article58549315. Retrieved 14 February 2012. ^ Gillespie, Richard (2002). "Dating the First Australians (full text)" (PDF). Radiocarbon 44 (2): 455–472. Retrieved on 28 July 2014. ^ "The spread of people to Australia". Australian Museum. http://australianmuseum.net.au/The-spread-of-people-to-Australia. ^ Viegas, Jennifer (3 July 2008). "Early Aussie Tattoos Match Rock Art". Discovery News. Archived from the original on 10 July 2008. https://web.archive.org/web/20080710014604/http://dsc.discovery.com/news/2008/07/03/australia-tattoos-art.html. Retrieved 30 March 2010. ^ "European discovery and the colonisation of Australia". Australian Government: Culture Portal. Department of the Environment, Water, Heritage and the Arts, Commonwealth of Australia. 11 January 2008. Archived from the original on 16 February 2011. https://web.archive.org/web/20110216230554/http://www.cultureandrecreation.gov.au/articles/australianhistory/. ^ Briscoe, Gordon; Smith, Len (2002). The Aboriginal Population Revisited: 70,000 years to the present. Canberra, Australia: Aboriginal History Inc.. p. 12. ISBN 978-0-9585637-6-5. ^ Dawkins, Kezia (1 February 2004). "1967 Referendum". Australian Broadcasting Corporation. Archived from the original on 20 April 2010. http://www.abc.net.au/messageclub/duknow/stories/s888141.htm. Retrieved 30 March 2010. ^ "History of the Commonwealth". Commonwealth of Nations. http://www.commonwealthofnations.org/commonwealth/history/. Retrieved 16 February 2015. ^ Otto, Kristin (25 June – 9 July 2007). "When Melbourne was Australia's capital city". Melbourne, Victoria: University of Melbourne. Archived from the original on 2 April 2010. https://web.archive.org/web/20100402083202/http://uninews.unimelb.edu.au/news/4332/. Retrieved 29 March 2010. ^ Official year book of the Commonwealth of Australia. Australian Bureau of Statistics. 1957. http://books.google.com/?id=-embDa-x6MwC. ^ "First World War 1914–1918". Australian War Memorial. Archived from the original on 7 December 2006. http://www.awm.gov.au/atwar/ww1.htm. Retrieved 5 December 2006. ^ Tucker, Spencer (2005). Encyclopedia of World War I. Santa Barbara, California: ABC-CLIO. p. 273. ISBN 1-85109-420-2. http://books.google.com/?id=2YqjfHLyyj8C&pg=PA273. ^ Nelson, Hank (1997). "Gallipoli, Kokoda and the Making of National Identity". Journal of Australian Studies 53 (1): 148–60. ^ "Statute of Westminster Adoption Act 1942 (Cth)". National Archives of Australia. http://foundingdocs.gov.au/item-did-25.html. Retrieved 28 July 2014. ^ "How Australia's Parliament works". Australian Geographic. http://www.australiangeographic.com.au/topics/features/2010/08/how-australias-parliament-works. Retrieved 16 June 2014. ^ "Governor-General's Role". Governor-General of Australia. Archived from the original on 4 August 2008. https://web.archive.org/web/20080804130529/http://www.gg.gov.au/governorgeneral/category.php?id=2. Retrieved 23 April 2010. ^ Downing, Susan (23 January 1998). "The Reserve Powers of the Governor-General". 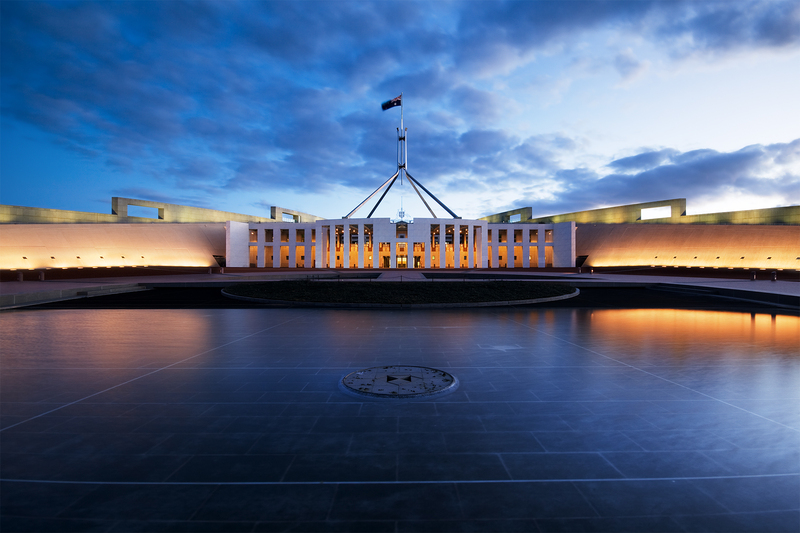 Parliament of Australia. Archived from the original on 26 July 2010. http://www.aph.gov.au/library/pubs/rn/1997-98/98rn25.htm. Retrieved 18 June 2010. ^ a b "The World Factbook 2009". Washington, D.C.: Central Intelligence Agency. 2009. Archived from the original on 24 March 2010. https://www.cia.gov/library/publications/the-world-factbook/index.html. Retrieved 29 March 2010. ^ a b "Senate Summary". Australian Broadcasting Corporation. Archived from the original on 6 May 2010. http://www.abc.net.au/elections/federal/2007/guide/senatecomposition.htm. Retrieved 23 April 2010. ^ "Voting HOR". Australian Electoral Commission. 31 July 2007. Archived from the original on 25 May 2010. http://www.aec.gov.au/Voting/How_to_vote/Voting_HOR.htm. Retrieved 23 April 2010. ^ "Election Summary: Tasmania". Australian Broadcasting Corporation. Archived from the original on 3 May 2010. http://www.abc.net.au/elections/federal/2007/guide/state_tas.htm. Retrieved 23 April 2010. ^ Evans, Tim (2006). "Compulsory Voting in Australia". Australian Electoral Commission. p. 4. Archived from the original on 18 June 2009. http://www.aec.gov.au/pdf/voting/compulsory_voting.pdf. Retrieved 21 June 2009. ^ "What happens if I do not vote?". Voting Australia – Frequently Asked Questions. Australian Electoral Commission. Archived from the original on 18 December 2007. http://aec.gov.au/FAQs/Voting_Australia.htm#What%20happens%20if%20I%20do%20not%20vote. Retrieved 8 January 2008. ^ "Governor-General's Role". Governor-General of the Commonwealth of Australia. Archived from the original on 14 October 2012. https://web.archive.org/web/20121014171300/http://www.gg.gov.au/content.php/page/id/3/title/governor-generals-role. Retrieved 13 January 2012. ^ "State of the Parties". Australian Broadcasting Corporation. Archived from the original on 18 April 2010. http://www.abc.net.au/elections/federal/2007/results/sop.htm. Retrieved 23 April 2010. ^ Fenna, Alan; Robbins, Jane; Summers, John (2013). Government Politics in Australia. London, United Kingdom: Pearson Higher Education AU. p. 139. ISBN 978 1486 00138 5. ^ "Gillard ousts Rudd in bloodless coup". Australian Broadcasting Corporation. 24 June 2010. Archived from the original on 25 June 2010. https://web.archive.org/web/20100625130706/http://www.abc.net.au/news/stories/2010/06/24/2935500.htm. Retrieved 24 June 2010. ^ "Role of the Administrator". Government House Northern Territory. 16 June 2008. Archived from the original on 30 April 2013. https://web.archive.org/web/20130430111225/http://www.nt.gov.au/administrator/administrator.shtml. Retrieved 30 March 2010. ^ "Governor-General's Role". Governor–General of the Commonwealth of Australia. Archived from the original on 4 August 2008. https://web.archive.org/web/20080804130529/http://www.gg.gov.au/governorgeneral/category.php?id=2. Retrieved 30 March 2010. ^ "Administrator of Norfolk Island". Australian Government Attorney-General's Department. Archived from the original on 6 August 2008. https://web.archive.org/web/20080806021653/http://ag.gov.au/www/agd/agd.nsf/Page/Territories_of_AustraliaNorfolk_IslandAdministrator_of_Norfolk_Island. ^ "Commonwealth Heads of Government Meeting". Commonwealth website. Pall Mall, London: Commonwealth Secretariat. 2009. Archived from the original on 26 March 2010. http://www.thecommonwealth.org/subhomepage/33247/. Retrieved 16 April 2010. ^ "Australia:About". Organisation for Economic Co-operation and Development. Archived from the original on 20 April 2010. http://www.oecd.org/about/0,3347,en_33873108_33873229_1_1_1_1_1,00.html. Retrieved 23 April 2010. ^ "Australia – Member information". World Trade Organization. Archived from the original on 25 May 2010. http://www.wto.org/english/thewto_e/countries_e/australia_e.htm. Retrieved 23 April 2010. ^ "Australia-United States Free Trade Agreement". Canberra, ACT: Department of Foreign Affairs and Trade. Archived from the original on 17 March 2010. http://www.dfat.gov.au/trade/negotiations/us_fta/index.html. Retrieved 30 March 2010. ^ "Closer Economic Relations". Canberra, ACT: Department of Foreign Affairs and Trade. Archived from the original on 8 October 2009. http://replay.web.archive.org/20091008192957/http://www.dfat.gov.au/geo/new_zealand/anz_cer/anz_cer.html. Retrieved 30 March 2010. ^ "Japan-Australia Relations". Ministry of Foreign Affairs of Japan. Archived from the original on 23 May 2010. http://www.mofa.go.jp/region/asia-paci/australia/index.html. Retrieved 19 June 2010. ^ "Gillard confident of S Korean trade deal – ABC News (Australian Broadcasting Corporation)". Abc.net.au. http://www.abc.net.au/news/stories/2011/04/25/3200038.htm. Retrieved 26 April 2011. ^ "S. Korea, Australia set free-trade talks deadline". Nz.news.yahoo.com. http://nz.news.yahoo.com/a/-/full-coverage/9256348/s-korea-australia-set-freetrade-talks-deadline/. Retrieved 26 April 2011. ^ Arvanitakis, James; Tyler, Amy (3 June 2008). "In Defence of Multilateralism". Centre for Policy Development. Archived from the original on 17 September 2009. https://web.archive.org/web/20090917192642/http://cpd.org.au/article/in-defence-multilateralism. ^ "Appendix 7: People: Defence actual staffing". Defence Annual Report 2008–09. Department of Defence. http://www.defence.gov.au/budget/08-09/dar/vol1/append07_01.htm. Retrieved 28 June 2010. ^ "Budget 2010–11: Portfolio budget overview". Australian Department of Defence. 2010. Archived from the original on 16 May 2011. https://web.archive.org/web/20110516044750/http://www.minister.defence.gov.au/Faulknertpl.cfm?CurrentId=10273. Retrieved 28 June 2010. ^ "Australia's Size Compared". Geoscience Australia. Archived from the original on 24 March 2007. https://web.archive.org/web/20070324194241/http://www.ga.gov.au/education/facts/dimensions/compare.htm. Retrieved 19 May 2007. ^ "Islands". Geoscience Australia. Archived from the original on 24 April 2010. https://web.archive.org/web/20100424005732/http://www.ga.gov.au/education/geoscience-basics/landforms/islands.jsp. "Being surrounded by ocean, Australia often is referred to as an island continent. As a continental landmass it is significantly larger than the many thousands of fringing islands ..."
^ "Australia in Brief: The island continent". Department of Foreign Affairs and Trade. Archived from the original on 4 June 2009. http://www.dfat.gov.au/aib/island_continent.html. Retrieved 29 May 2009. "Mainland Australia, with an area of 7.69 million square kilometres, is the Earth's largest island but smallest continent." ^ "Oceans and Seas – Geoscience Australia". Geoscience Australia. Archived from the original on 3 July 2009. https://web.archive.org/web/20090703204723/http://www.ga.gov.au/education/geoscience-basics/dimensions/oceans-seas.jsp. ^ UNEP World Conservation Monitoring Centre (1980). "Protected Areas and World Heritage – Great Barrier Reef World Heritage Area". Department of the Environment and Heritage. Archived from the original on 28 May 2007. https://web.archive.org/web/20070528210526/http://sea.unep-wcmc.org/sites/wh/gbrmp.html. Retrieved 19 May 2007. ^ "Highest Mountains". Geoscience Australia. http://www.ga.gov.au/education/geoscience-basics/landforms/highest-mountains.html. Retrieved 2 February 2012. ^ "Parks and Reserves—Australia's National Landscapes". Environment.gov.au. 23 November 2011. http://www.environment.gov.au/parks/national-landscapes/index.html. Retrieved 4 January 2012. ^ Grant, Cameron (August 2007). "Damaged Dirt". The Advertiser. Archived from the original on 6 July 2011. https://web.archive.org/web/20110706100423/http://www.1degree.com.au/files/AdvertiserPartworks_Part3_Page8.pdf?download=1&filename=AdvertiserPartworks_Part3_Page8.pdf. Retrieved 23 April 2010. "Australia has the oldest, most highly weathered soils on the planet." ^ "Australia – Climate of a Continent". Bureau of Meterorology. Archived from the original on 26 March 2010. http://www.bom.gov.au/lam/climate/levelthree/ausclim/zones.htm. Retrieved 30 March 2010. ^ a b "Countries of the World (by lowest population density)". WorldAtlas. Archived from the original on 24 March 2010. http://www.worldatlas.com/aatlas/populations/ctydensityl.htm. Retrieved 30 March 2010. ^ (2006) "Cattle, crops and clearing: Regional drivers of landscape change in the Brigalow Belt, Queensland, Australia, 1840–2004". Landscape and Urban Planning 78 (4): 375–376. DOI:10.1016/j.landurbplan.2005.11.00. ^ "Einasleigh upland savanna". Terrestrial Ecoregions. World Wildlife Fund. http://worldwildlife.org/ecoregions/aa0705. Retrieved 16 June 2010. ^ "Mitchell grass downs". Terrestrial Ecoregions. World Wildlife Fund. http://worldwildlife.org/ecoregions/aa0707. Retrieved 16 June 2010. ^ "Eastern Australia mulga shrublands". Terrestrial Ecoregions. World Wildlife Fund. http://worldwildlife.org/ecoregions/aa0802. Retrieved 16 June 2010. ^ "Southeast Australia temperate savanna". Terrestrial Ecoregions. World Wildlife Fund. http://worldwildlife.org/ecoregions/aa0803. Retrieved 16 June 2010. ^ "Arnhem Land tropical savanna". Terrestrial Ecoregions. World Wildlife Fund. http://worldwildlife.org/ecoregions/aa0701. Retrieved 16 June 2010. ^ "Rangelands – Overview". Australian Natural Resources Atlas. Australian Government. 27 June 2009. Archived from the original on 30 April 2010. https://web.archive.org/web/20100430171751/http://www.anra.gov.au/topics/rangelands/overview/qld/ibra-gup.html. Retrieved 16 June 2010. ^ "Cape York Peninsula tropical savanna". Terrestrial Ecoregions. World Wildlife Fund. http://worldwildlife.org/ecoregions/aa0703. Retrieved 16 June 2010. ^ "Victoria Plains tropical savanna". Terrestrial Ecoregions. World Wildlife Fund. http://worldwildlife.org/ecoregions/aa0709. Retrieved 16 June 2010. ^ "Western Australian Mulga shrublands". Terrestrial Ecoregions. World Wildlife Fund. http://worldwildlife.org/ecoregions/aa1310. Retrieved 16 June 2010. ^ "Central Ranges xeric scrub". Terrestrial Ecoregions. World Wildlife Fund. http://worldwildlife.org/ecoregions/aa1302. Retrieved 16 June 2010. ^ "Tirari-Sturt stony desert". Terrestrial Ecoregions. World Wildlife Fund. http://worldwildlife.org/ecoregions/aa1309. Retrieved 16 June 2010. ^ "Great Sandy-Tanami desert". Terrestrial Ecoregions. World Wildlife Fund. http://worldwildlife.org/ecoregions/aa1304. Retrieved 16 June 2010. ^ "About Biodiversity". Department of the Environment and Heritage. Archived from the original on 5 February 2007. https://web.archive.org/web/20070205015628/www.environment.gov.au/biodiversity/about-biodiversity.html. Retrieved 18 September 2007. ^ Lambertini, Marco (2000) (excerpt). A Naturalist's Guide to the Tropics. University of Chicago Press. ISBN 0-226-46828-3. http://www.press.uchicago.edu/Misc/Chicago/468283.html. Retrieved 30 March 2010. ^ "Humans to blame for extinction of Australia's megafauna". The University of Melbourne. 8 June 2001. Archived from the original on 2 April 2010. https://web.archive.org/web/20100402065113/http://uninews.unimelb.edu.au/view.php?articleID=170. Retrieved 30 March 2010. ^ "The Thylacine Museum – A Natural History of the Tasmanian Tiger". The Thylacine Museum. http://www.naturalworlds.org/thylacine/index.htm. Retrieved 14 October 2013. ^ "National Threatened Species Day". Department of the Environment and Heritage, Australian Government. 2006. Archived from the original on 9 December 2006. http://www.deh.gov.au/biodiversity/threatened/ts-day/index.html. Retrieved 21 November 2006. ^ "Invasive species". Department of the Environment, Water, Heritage and the Arts. 17 March 2010. Archived from the original on 29 June 2010. http://www.environment.gov.au/biodiversity/invasive/index.html. Retrieved 14 June 2010. ^ "Australia's most endangered species". Australian Geographic. http://www.australiangeographic.com.au/topics/wildlife/2012/10/australias-most-endangered-species. Retrieved 16 June 2014. ^ "About the EPBC Act". Department of the Environment, Water, Heritage and the Arts. Archived from the original on 31 May 2010. http://www.environment.gov.au/epbc/about/index.html. Retrieved 14 June 2010. ^ "National Strategy for the Conservation of Australia's Biological Diversity". Department of the Environment, Water, Heritage and the Arts. 21 January 2010. Archived from the original on 12 March 2011. https://web.archive.org/web/20110312021249/http://www.environment.gov.au/biodiversity/publications/strategy/index.html. Retrieved 14 June 2010. ^ "Conservation of biological diversity across Australia". Department of the Environment, Water, Heritage and the Arts. 19 January 2009. Archived from the original on 13 March 2011. https://web.archive.org/web/20110313222100/http://www.environment.gov.au/biodiversity/publications/strategy/chap1.html. Retrieved 14 June 2010. ^ "The List of Wetlands of International Importance" (PDF). Ramsar Convention. 22 May 2010. pp. 6–7. http://www.ramsar.org/pdf/sitelist.pdf. Retrieved 14 June 2010. ^ "2014 Environmental Performance Index". Yale University. Archived from the original on 4 July 2014. https://web.archive.org/web/20140704103128/http://epi.yale.edu/epi/country-rankings. Retrieved 11 November 2014. ^ Smith, Deborah (22 May 2007). "Australia's carbon dioxide emissions twice world rate". The Sydney Morning Herald. Archived from the original on 17 March 2010. https://web.archive.org/web/20100317133709/http://www.smh.com.au/news/environment/australias-greenhouse-emissions-twice-world-rate/2007/05/22/1179601374518.html. Retrieved 30 March 2010. ^ "Annual Australian Climate Statement 2011". Bom.gov.au. 4 January 2012. http://www.bom.gov.au/announcements/media_releases/climate/change/20120104.shtml. Retrieved 15 April 2012. ^ "Annual climate statement of 2014". Bureau of Meteorology. 6 January 2015. http://www.bom.gov.au/climate/current/annual/aus/. Retrieved 2 February 2014. ^ "2014 was Australia's warmest year on record: BoM". ABC Online. 21 January 2015. http://www.abc.net.au/news/2015-01-06/bureau-weather-wrap-2014/6001826. Retrieved 2 February 2015. ^ "National review of water restrictions in Australia". Australian Government National Water Commission. 15 January 2010. Archived from the original on 27 February 2012. https://web.archive.org/web/20120227083656/http://www.nwc.gov.au/urban/more/national-review-of-water-restrictions-in-australia. Retrieved 27 September 2012. ^ "Carbon price helped curb emissions, ANU study finds". The Sydney Morning Herald. 17 July 2014. http://www.smh.com.au/environment/climate-change/carbon-price-helped-curb-emissions-anu-study-finds-20140716-ztuf6.html. Retrieved 8 April 2015. ^ Palmer, Brad (6 November 2014). "Australia repealed its carbon tax — and emissions are now soaring". The University of Melbourne. http://www.energy.unimelb.edu.au/documents/australia-repealed-its-carbon-tax-—-and-emissions-are-now-soaring. Retrieved 8 April 2015. ^ "Australia, wealthiest nation in the world". 20 October 2011. http://finance.ninemsn.com.au/newsbusiness/8362821/australia-wealthiest-nation-in-world-report. Retrieved 24 July 2012. ^ "Australian's the world's wealthiest". The Sydney Morning Herald. 31 October 2011. http://www.smh.com.au/executive-style/luxury/australians-the-worlds-wealthiest-20111101-1mt2r.html. Retrieved 24 July 2012. ^ a b Credit Suisse Research Institute (9 October 2013). "Global Wealth Reaches New All-Time High". The Financialist. Credit Suisse. http://www.thefinancialist.com/global-wealth-reaches-new-all-time-high/. Retrieved 10 October 2013. ^ AAP (12 October 2013). "Richest nation but poverty increasing". The Australian. http://www.theaustralian.com.au/news/latest-news/richest-nation-but-poverty-increasing/story-fn3dxiwe-1226738699752?from=public_rss&utm_source=The%20Australian&utm_medium=email&utm_campaign=editorial&net_sub_uid=44933799. Retrieved 12 October 2013. ^ "On the International Realignment of Exchanges and Related Trends in Self-Regulation – Australian Stock Exchange" (PDF). Archived from the original on 13 December 2010. https://web.archive.org/web/20101213134633/http://asx.com.au/about/pdf/asx_speech_eric_mayne_061106.pdf. Retrieved 3 January 2010. ^ "Australia". 2010 Index of Economic Freedom. Archived from the original on 30 March 2010. http://www.heritage.org/index/Country/Australia. Retrieved 30 March 2010. ^ "Human Development Report 2010 – tables". United Nations. 2010. Archived from the original on 29 April 2011. http://hdr.undp.org/en/media/HDR_2010_EN_Tables_reprint.pdf. Retrieved 25 April 2011. ^ "Melbourne 'world's top city'". The Age. 6 February 2004. Archived from the original on 30 January 2009. https://web.archive.org/web/20090130144426/http://www.theage.com.au/articles/2004/02/06/1075854028808.html. Retrieved 31 January 2009. ^ Hughes, Tim. "Australian dollar continues astronomical rise to 30-year highs as US dollar, euro tank". Courier Mail. http://www.couriermail.com.au/money/money-matters/australian-dollar-continues-astronomical-rise-to-30-year-highs-as-us-dollar-euro-tank/story-fn3hskur-1226044717380. Retrieved 26 April 2011. ^ "Australia Public debt – Economy". Indexmundi.com. 9 January 2012. http://www.indexmundi.com/australia/public_debt.html. Retrieved 15 April 2012. ^ "Nick Bryant's Australia: Australian affordablity". BBC. http://www.bbc.co.uk/blogs/thereporters/nickbryant/2011/04/australian_affordablity.html. Retrieved 26 April 2011. ^ "5368.0 – International Trade in Goods and Services, Australia, April 2007". Australian Bureau of Statistics. 31 May 2007. http://www.abs.gov.au/AUSSTATS/abs@.nsf/DetailsPage/5368.0Apr%202007?OpenDocument. Retrieved 14 June 2010. ^ "World Economic Outlook (WEO) 2010 Rebalancing Growth". International Monetary Fund. http://www.imf.org/external/pubs/ft/weo/2010/01/. Retrieved 31 May 2012. ^ "Australia slashes immigration as recession looms". London: The Independent. 16 March 2009. http://www.independent.co.uk/news/world/australasia/australia-slashes-immigration-as-recession-looms-1646048.html. Retrieved 26 April 2011. ^ Mclennan, David (12 April 2011). "Australian economy growing as new recession fears fade". The Canberra Times. Archived from the original on 11 October 2011. https://web.archive.org/web/20111011082911/http://www.canberratimes.com.au/news/national/national/general/australian-economy-growing-as-new-recession-fears-fade/2130847.aspx. Retrieved 26 April 2011. ^ "National economy grows but some non-mining states in recession". The Conversation. http://theconversation.com/national-economy-grows-but-some-non-mining-states-in-recession-12670. Retrieved 22 March 2013. ^ Syvret, Paul (7 April 2012). "Mining punches through recession". Courier Mail. Archived from the original on 16 April 2012. https://web.archive.org/web/20120416091909/http://www.couriermail.com.au/business/mining-punches-through-recession/story-fn7kjcme-1226320756339. ^ "Non-mining states going backwards". ABC. http://www.abc.net.au/news/2012-04-23/non-mining-states-27going-backwards27/3967622. Retrieved 22 March 2013. ^ Macfarlane, I. J. (October 1998). "Australian Monetary Policy in the Last Quarter of the Twentieth Century" (PDF). Reserve Bank of Australia Bulletin. http://www.rba.gov.au/publications/bulletin/1998/oct/pdf/bu-1098-2.pdf. Retrieved 7 December 2010. ^ Parham, Dean (1 October 2002). "Microeconomic reforms and the revival in Australia's growth in productivity and living standards" (PDF). Conference of Economists, Adelaide. http://www.pc.gov.au/__data/assets/pdf_file/0009/9369/mrrag.pdf. Retrieved 7 December 2010. ^ Tran-Nam, Binh. "The Implementation Costs of the GST in Australia: Concepts, Preliminary Estimates and Implications  JlATax 23; (2000) 3(5)". Journal of Australian Taxation 331. Retrieved on 23 April 2010. ^ "Government to help Kalgoorlie quake victims". Australian Broadcasting Corporation. 20 April 2010. Archived from the original on 6 June 2010. http://www.abc.net.au/news/stories/2010/04/20/2877497.htm. Retrieved 2 June 2010. ^ Patricia Karvelas (13 November 2013). "Call for end to welfare poverty". The Australian. http://www.theaustralian.com.au/national-affairs/call-for-end-to-welfare-poverty/story-fn59niix-1226758553935?from=public_rss&utm_source=The%20Australian&utm_medium=email&utm_campaign=editorial&net_sub_uid=44933799#. Retrieved 15 November 2013. ^ "Australian Graduate Survey". graduatecareers.com.au. http://www.graduatecareers.com.au/research/surveys/australiangraduatesurvey. ^ "Australia. CIA – The World Factbook". Cia.gov. Archived from the original on 29 December 2010. https://www.cia.gov/library/publications/the-world-factbook/geos/as.html. Retrieved 22 January 2011. ^ "Wine Australia". wineaustralia. Archived from the original on 23 October 2010. https://web.archive.org/web/20101023194405/http://www.wineaustralia.com/australia/. Retrieved 22 October 2010. ^ "Reflecting a Nation: Stories from the 2011 Census, 2012–2013". Australian Bureau of Statistics. 21 June 2012. http://www.abs.gov.au/ausstats/abs@.nsf/Lookup/2071.0main+features902012-2013. Retrieved 25 June 2012. ^ "3105.0.65.001—Australian Historical Population Statistics, 2006" (XLS). Australian Bureau of Statistics. 23 May 2006. Archived from the original on 8 September 2007. http://www.abs.gov.au/AUSSTATS/abs@.nsf/DetailsPage/3105.0.65.0012006?OpenDocument. Retrieved 18 September 2007. "Australian population: (1919) 5,080,912; (2006) 20,209,993"
^ "Background note: Australia". US Department of State. Archived from the original on 20 May 2007. http://www.state.gov/r/pa/ei/bgn/2698.htm. Retrieved 19 May 2007. ^ a b "Fact Sheet 20 – Migration Program Planning Levels". Department of Immigration and Citizenship. 11 August 2009. Archived from the original on 7 May 2010. http://www.immi.gov.au/media/fact-sheets/20planning.htm. Retrieved 17 June 2010. ^ "Australian homes are biggest in the world". Switzer Daily. 23 August 2011. http://www.switzer.com.au/business-news/news-stories/australian-homes-are-biggest-in-the-world2/. Retrieved 5 November 2014. ^ "2011 Census reveals one in four Australians is born overseas". Australian Bureau of Statistics. 21 June 2012. http://abs.gov.au/websitedbs/censushome.nsf/home/CO-59?opendocument&navpos=620. Retrieved 21 June 2012. ^ a b c d "Cultural Diversity In Australia". Australian Bureau of Statistics. 16 April 2013. http://www.abs.gov.au/ausstats/abs@.nsf/Lookup/2071.0main+features902012-2013. Retrieved 11 January 2013. ^ "The Evolution of Australia's Multicultural Policy". Department of Immigration and Multicultural and Indigenous Affairs. 2005. Archived from the original on 19 February 2006. https://web.archive.org/web/20060219130703/http://www.immi.gov.au/facts/06evolution.htm. Retrieved 18 September 2007. ^ "Settler numbers on the rise". Minister for Immigration and Citizenship. 27 December 2006. Archived from the original on 9 June 2007. https://web.archive.org/web/20070609123847/http://www.minister.immi.gov.au/media/media-releases/2006/v06297.htm. Retrieved 7 December 2010. ^ "Targeted migration increase to fill skills gaps". Department of Immigration and Citizenship. 8 May 2012. Archived from the original on 11 May 2012. https://web.archive.org/web/20120511231240/http://www.minister.immi.gov.au/media/cb/2012/cb186408.htm. ^ "Fact Sheet 2 – Key Facts In Immigration – Department of Immigration and Citizenship". Immi.gov.au. http://www.immi.gov.au/media/fact-sheets/02key.htm. Retrieved 27 April 2013. ^ "Aboriginal and Torres Strait Islander Australia revealed as 2011 Census data is released". Australian Bureau of Statistics. 21 June 2012. http://abs.gov.au/websitedbs/censushome.nsf/home/CO-63?opendocument&navpos=620. Retrieved 21 June 2012. ^ "1301.0 – Year Book Australia, 2004". Australian Bureau of Statistics. 27 February 2004. Archived from the original on 15 May 2009. http://www.abs.gov.au/ausstats/abs@.nsf/Previousproducts/1301.0Feature%20Article52004?opendocument&tabname=Summary&prodno=1301.0&issue=2004&num=&view=. Retrieved 24 April 2009. ^ Lunn, Stephen (26 November 2008). "Life gap figures not black and white". The Australian. http://www.theaustralian.com.au/news/nation/life-gap-figures-not-black-and-white/story-e6frg6nf-1111118141529. Retrieved 7 December 2010. ^ Gibson, Joel (10 April 2009). "Indigenous health gap closes by five years". The Sydney Morning Herald. http://www.smh.com.au/national/indigenous-health-gap-closes-by-five-years-20090409-a27x.html. Retrieved 7 December 2010. ^ Grattan, Michelle (8 December 2006). "Australia hides a 'failed state'". Melbourne: The Age. Archived from the original on 19 November 2008. https://web.archive.org/web/20081119005946/http://www.theage.com.au/news/national/australia-hides-a-failed-state/2006/12/07/1165081088385.html. Retrieved 17 October 2008. ^ Duncan, Macgregor; Leigh, Andrew; Madden, David and Tynan, Peter (2004). Imagining Australia. Allen & Unwin. p. 44. ISBN 978-1-74114-382-9. http://books.google.com/?id=YeKqBMjrObIC&printsec=frontcover. ^ "3218.0 - Regional Population Growth, Australia, 2016" (in en). Australian Bureau of Statistics. 28 July 2017. http://www.abs.gov.au/AUSSTATS/abs@.nsf/Lookup/3218.0Main+Features12016?OpenDocument. Retrieved 10 August 2017. ^ A Snapshot of Early Childhood Development in Australia. Australian Government Department of Education, Employment and Workplace Relations. December 2009. p. 8. ISBN 978-0-9807246-0-8. Archived from the original on 8 April 2011. https://web.archive.org/web/20110408162508/http://www.rch.org.au/aedi/media/Snapshot_of_Early_Childhood_DevelopmentinAustralia_AEDI_National_Report.pdf. ^ "A mission to save indigenous languages". Australian Geographic. http://www.australiangeographic.com.au/news/2011/08/a-mission-to-save-indigenous-languages. Retrieved 16 June 2014. ^ a b "National Indigenous Languages Survey Report 2005". Department of Communications, Information Technology and the Arts. Archived from the original on 9 July 2009. https://web.archive.org/web/20090709141342/http://www.arts.gov.au/indigenous/national_indigenous_languages_survey_report_2005. Retrieved 5 September 2009. ^ Australian Bureau of Statistics (4 May 2010). "4713.0 – Population Characteristics, Aboriginal and Torres Strait Islander Australians, 2006" (in Canberra). Australian Bureau of Statistics. http://www.abs.gov.au/ausstats/abs@.nsf/mf/4713.0. Retrieved 7 December 2010. ^ "About Australia: Religious Freedom". Dfat.gov.au. Archived from the original on 6 August 2011. https://web.archive.org/web/20110806061716/http://www.dfat.gov.au/facts/religion.html. Retrieved 31 December 2011. ^ "Indigenous Traditions – Australian Aboriginal and Torres Strait Islanders". Abc.net.au. 14 December 1999. http://www.abc.net.au/religion/stories/s790117.htm. Retrieved 31 December 2011. ^ "2011 Census reveals Hinduism as the fastest growing religion in Australia". Australian Bureau of Statistics. 21 June 2012. http://abs.gov.au/websitedbs/censushome.nsf/home/CO-61?opendocument&navpos=620. Retrieved 21 June 2012. ^ Ian Townsend (30 January 2012). "Thousands of parents illegally home schooling". ABC News. http://www.abc.net.au/news/2012-01-28/thousands-of-parents-illegally-home-schooling/3798008. Retrieved 13 October 2013. ^ "Schooling Overview". Australian Government, Department of Education, Employment and Workplace Relations. Archived from the original on 28 March 2011. https://web.archive.org/web/20110328132033/http://www.deewr.gov.au/Schooling/Pages/overview.aspx. ^ "Education". Department of Immigration and Citizenship. http://www.immi.gov.au/living-in-australia/settle-in-australia/everyday-life/education/. Retrieved 14 January 2012. ^ "Our system of education". Australian Government: Department of Foreign Affairs and Trade. Archived from the original on 14 May 2011. https://web.archive.org/web/20110514101140/http://www.dfat.gov.au/facts/education_in_australia.html. Retrieved 13 January 2012. ^ "The Department of Education – Schools and You – Schooling". Det.wa.edu.au. Archived from the original on 21 March 2012. https://web.archive.org/web/20120321204923/http://det.wa.edu.au/schoolsandyou/detcms/navigation/parents-and-community/schooling/?oid=Category-id-3869597. Retrieved 31 December 2011. ^ "Education Act (NT) – Section 20". austlii.edu.au. http://www.austlii.edu.au/au/legis/nt/consol_act/ea104/s20.html. ^ "Education Act 1990 (NSW) – Section 21". austlii.edu.au. http://www.austlii.edu.au/au/legis/nsw/consol_act/ea1990104/s21b.html. ^ "Minimum school leaving age jumps to 17". The Age. 28 January 2009. http://news.theage.com.au/breaking-news-national/minimum-school-leaving-age-jumps-to-17-20090128-7r4d.html. Retrieved 30 May 2013. ^ "Literacy". CIA World Factbook. https://www.cia.gov/library/publications/the-world-factbook/fields/2103.html#136. Retrieved 10 October 2013. ^ "A literacy deficit". abc.net.au. 22 September 2013. http://www.abc.net.au/radionational/programs/backgroundbriefing/2013-09-22/4962902. Retrieved 10 October 2013. ^ "Australian Education | Australian Education System | Education | Study in Australia". Ausitaleem.com.pk. http://www.ausitaleem.com.pk/australian-education-system.shtml. Retrieved 31 December 2011. ^ "About Australian Apprenticeships". Australian Government. Archived from the original on 11 November 2009. http://replay.web.archive.org/20091111234035/http://www.australianapprenticeships.gov.au/about/default.asp. Retrieved 23 April 2010. ^ "Life expectancy". Australian Bureau of Statistics. http://www.abs.gov.au/ausstats/abs@.nsf/Lookup/by+Subject/4125.0~Jan+2012~Main+Features~Life+expectancy~3110. Retrieved 16 August 2012. ^ "Skin cancer – key statistics". Department of Health and Ageing. 2008. http://www.health.gov.au/internet/skincancer/publishing.nsf/Content/fact-2. ^ "About Overweight and Obesity". Department of Health and Ageing. Archived from the original on 7 May 2010. http://www.health.gov.au/internet/main/Publishing.nsf/Content/health-pubhlth-strateg-hlthwt-obesity.htm. ^ "Health care in Australia". About Australia. Department of Foreign Affairs and Trade. 2008. Archived from the original on 4 April 2010. https://web.archive.org/web/20100404084746/http://www.dfat.gov.au/facts/healthcare.html. ^ a b Biggs, Amanda (29 October 2004). "Medicare – Background Brief". Parliament of Australia: Parliamentary Library. Canberra, ACT: Commonwealth of Australia. Archived from the original on 14 April 2010. http://www.aph.gov.au/library/intguide/SP/medicare.htm. Retrieved 16 April 2010. ^ Australian Taxation Office (19 June 2007). "What is the Medicare levy?". Australian Taxation Office website. Australian Government. Archived from the original on 10 June 2008. https://web.archive.org/web/20080610171946/http://www.ato.gov.au/individuals/content.asp?doc=/content/17482.htm&pc=001/002/030/003/001&mnu=&mfp=&st=&cy=1. Retrieved 17 April 2010. ^ "About Australia: World Heritage properties". Department of Foreign Affairs and Trade. Archived from the original on 25 July 2010. http://www.dfat.gov.au/facts/world_heritage.html. Retrieved 14 June 2010. ^ Henly, Susan Gough (6 November 2005). "Powerful growth of Aboriginal art". The New York Times. http://www.nytimes.com/2005/11/06/arts/06iht-aborigine.html. ^ Germaine, Max (1990). Artists & Galleries of Australia. Roseville, Vic. : Craftsman House. pp. 756–58, 796–97, 809–10, 814–15, 819–20, 826–27, 829–30. ISBN 976-8097-02-7. ^ Sarwal, Amit; Sarwal, Reema (2009). Reading Down Under: Australian Literary Studies Reader. SSS Publications. p. xii. ISBN 978-8190228213. ^ Hughes-D'Aeth, Tony (15 October 2014). "Australia’s Booker prize record suggests others will come in Flanagan’s wake", The Conversation. Retrieved 17 April 2014. ^ "Tranter, John (1977) A warrior poet living still at Anzac Cove: Review of The Vernacular Republic: Selected Poems". Johntranter.com. 29 January 1977. http://johntranter.com/reviewer/1977-murray.shtml. Retrieved 14 June 2010. ^ "Arts funding guide 2010" (PDF). Australia Council. 2010. Archived from the original on 5 July 2010. http://www.australiacouncil.gov.au/__data/assets/pdf_file/0019/13753/Australia_Council_for_the_Arts_-_Funding_Guide_2010.pdf. Retrieved 14 June 2010. ^ "Opera in Australia". Department of the Environment, Water, Heritage and the Arts. 5 March 2007. Archived from the original on 6 April 2011. https://web.archive.org/web/20110406111552/http://www.cultureandrecreation.gov.au/articles/music/opera/. ^ Brandis, George (8 May 2007). "35 per cent increase in funding for Australia's major performing arts companies". Department of Communications, Information Technology and the Arts. Archived from the original on 12 November 2007. http://pandora.nla.gov.au/pan/36698/20071112-1356/www.minister.dcita.gov.au/brandis/media/media_releases/2007/35_per_cent_increase_in_funding_for_australias_major_performing_arts_companies.html. Retrieved 23 April 2010. ^ "Culture.gov.au – "Film in Australia"". Australian Government: Culture Portal. Department of the Environment, Water, Heritage and the Arts, Commonwealth of Australia. 22 November 2007. Archived from the original on 27 March 2011. https://web.archive.org/web/20110327002350/http://www.cultureandrecreation.gov.au/articles/film/. ^ Sowada, Richard (6 February 2013). Mad Max. Interview with Patricia Karvelas. Historyonics. RN Drive. http://www.abc.net.au/radionational/programs/drive/historyonics3a-mad-max/4504578. Retrieved 31 January 2015. ^ Reporters Without Borders (2010). "Press Freedom Index 2010". Reporters Without Borders. Archived from the original on 24 November 2010. http://en.rsf.org/press-freedom-index-2010,1034.html. Retrieved 22 November 2010. ^ Gardiner-Garden, John and Chowns, Jonathan (30 May 2006). "Media Ownership Regulation in Australia". Parliament of Australia. Archived from the original on 28 March 2010. http://www.aph.gov.au/library/INTGUIDE/SP/Media_Regulation.htm. ^ "Bush Tucker Plants, or Bush Food". Teachers.ash.org.au. Archived from the original on 11 May 2011. http://www.teachers.ash.org.au/bushtucker/. Retrieved 26 April 2011. ^ "Bush Tucker". Theepicentre.com. Archived from the original on 13 May 2011. http://www.theepicentre.com/Australia/aufood2.html. Retrieved 26 April 2011. ^ "Australian food and drink". Department of the Environment, Water, Heritage and the Arts. 23 September 2008. Archived from the original on 26 March 2010. https://web.archive.org/web/20100326134155/http://www.cultureandrecreation.gov.au/articles/foodanddrink/. ^ "Modern Australian recipes and Modern Australian cuisine". Special Broadcasting Service. Archived from the original on 3 May 2010. http://www.sbs.com.au/food/cuisineindex/RecipeByCuisineMain/383. Retrieved 23 April 2010. ^ Pereira da Costa, Lamartine (2013). Worldwide Experiences and Trends in Sport for All. Meyer & Meyer Verlag. p. 68. ISBN 978-1-84126-085-3. ^ "The Beach". Australian Government: Culture Portal. Department of the Environment, Water, Heritage and the Arts, Commonwealth of Australia. 17 March 2008. Archived from the original on 26 February 2010. https://web.archive.org/web/20100226144234/http://www.cultureandrecreation.gov.au/articles/beach. ^ Pike, Jeffrey (2004). Australia. Langenscheidt Publishing Group. p. 103. ISBN 978-9812347992. ^ Booth, Douglas (2012). Australian Beach Cultures: The History of Sun, Sand and Surf. Routledge. p. 39. ISBN 978-0714681788. ^ Campbell, Peter. "Rolex Sydney Hobart Yacht Race". cyca.com.au. Cruising Yacht Club of Australia. http://www.cyca.com.au/racing/rolex-sydney-hobart-yacht-race/. Retrieved 6 June 2015. ^ "Flag Bearers". Australian Commonwealth Games Association. http://www.commonwealthgames.org.au/page/65/by-games. Retrieved 23 April 2010. ^ "Past Commonwealth Games". Commonwealth Games Federation. Archived from the original on 15 March 2010. http://www.thecgf.com/games/games_index.asp?linkresults=1. Retrieved 23 April 2010. ^ Linden, Julian (31 January 2015). "Factbox - Asian Cup champions Australia". Reuters (Thomson Reuters). http://uk.reuters.com/article/2015/01/31/uk-soccer-asia-australia-factbox-idUKKBN0L40BQ20150131. Retrieved 6 June 2015. Davison, Graeme; Hirst, John; Macintyre, Stuart (1999). The Oxford Companion to Australian History. Melbourne: Oxford University Press. ISBN 0-19-553597-9. Smith, Bernard; Smith, Terry (1991). Australian painting 1788–1990. Melbourne: Oxford University Press. ISBN 0-19-554901-5. This page uses content from the English language Wikipedia. The original content was at Australia. The list of authors can be seen in the page history. As with this Familypedia wiki, the content of Wikipedia is available under the Creative Commons License.